Reuters: Oman’s Oil Minister said on Sunday he was excited to be part of the Sri Lanka oil refinery project, in a sign that plans for the sultanate’s involvement may be back on track. 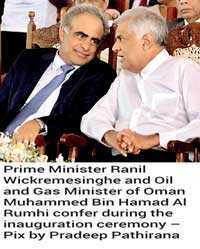 Sri Lanka said last week that Oman Oil Co. had made clear it was interested in taking a 30% stake in the new refinery on Sri Lanka’s south coast. 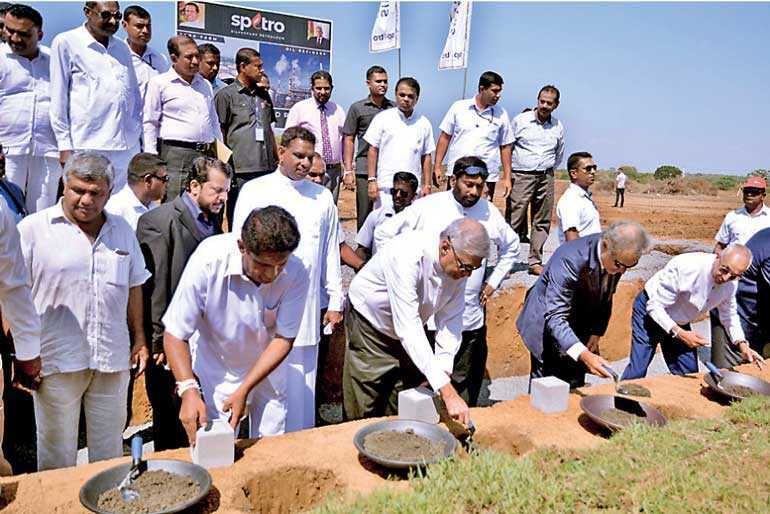 Rumhy joined Sri Lankan Prime Minister Ranil Wickremesinghe at the laying of the foundation stone for the planned $3.85 billion oil refinery at Hambantota on the south coast, which would potentially be the island’s biggest foreign direct investment. “This is not a project just for three years. This is a lifelong project,” Rumhy said at the launch ceremony held at the Mirijjawila investment zone in Hambantota. “We will work very hard to deliver this project to the people of Sri Lanka.” However, he did not comment on whether Oman planned to have a direct stake in the refinery. The India-based Accord Group is the main investor in the refinery project through a Singapore entity it controls. The project will be Sri Lanka’s first new refinery in 52 years after Iran built a 50,000 barrel-per-day refinery near the island’s capital city of Colombo to blend Iran light oils. The new refinery will export all products it refines, officials have said. “We have Chinese investment, we have Indian investments, we have Oman interest for investment, and we have investment interest from many other countries,” Wickremesinghe said at the event. “It shows that Hambantota will become the multinational investment zone.” A senior Sri Lankan minister, who declined to be identified because he is not authorised to talk to the media, told Reuters that Oman had given a commitment to invest in the refinery and there would not be any turning back. But on Wednesday, Salim al-Aufi, the Undersecretary of Oman’s Oil & Gas Ministry, said “no one on this side” was aware of the investment. Sri Lanka’s investment board said last week that another Oman entity, Oman Trading International, was willing to supply all of the refinery’s feedstock needs and take on the marketing of the oil products it would produce. China is the biggest buyer of Omani oil. In January it imported about 80% of Oman’s crude exports, Oman Government data shows. [size=17]Finance Minister Mangala Samaraweera said the refinery project was only part of the Government’s larger plans to increase exports and improve FDI to make development accessible to all Sri Lankans and create an affluent middle class. 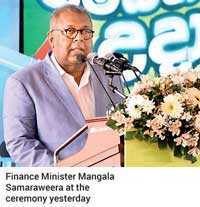 Speaking at the inauguration of the $3.8 billion refinery project in Hambantota, Samaraweera said trade and investment must come together so that Sri Lanka can grow without depending on debt, as was done in the past. “Our hope is to extend our trade activities in order to become the economic centre point in the Indian Ocean. We have plans to increase investment and improve ease of business in order to attract more investments,” he said. The Minister described the project as a major investment initiative that is the biggest single investment in Sri Lanka since Independence. It was appropriate to start the project on Sunday as it was also the 70th Birthday of Prime Minister Ranil Wickremesinghe. Samaraweera pointed out that Hambantota was the most under-developed area of the country in the past but argued it was now rapidly transforming itself into a 21st century metropolis. He thanked Development Strategies and International Trade Minister Malik Samarawickrama for bringing in the investment to Sri Lanka. “These new investment projects launched in Hambantota worth $4 billion dollars, I believe, are a new beginning in our economy. I believe that if the profits can’t be reaped by the people of the country, then the investments were not good enough. We are still paying the heavy interests of the foreign debt taken before we came to power in 2015. We have created a platform for more Foreign Direct Investment (FDI) to come into the country without having to take more foreign debt,” he said. For a country to develop, it requires both FDI and exports, and the Government had been successful in delivering on both those fronts, Samaraweera emphasised. He also pointed out that 2018 was the year when Sri Lanka recorded the highest amount of FDI and exports.